The analysis was carried out as part of leading German tyre manufacturer, Continental Tyre Group’s commitment to its Vision Zero strategy, a long term plan to reduce accidents through tyre technologies and innovative automotive systems. Advance Pitstop and its chain of 30 outlets are a wholly owned part of Continental Tyre Group. Uneven wear with one side of the tyre worn down to dangerous levels due to incorrect balancing and tyre tracking”. “I would describe tyres like these as ticking bombs – nobody knows ‘the when’ or ‘the where’ that one of these tyres could lead to a catastrophic failure. For sure, it would not only be a disaster for the driver and occupants of the vehicle in question, but also for any other unsuspecting road user who just happened to be on the same road at the same time”. Justin Glynn, Branch Manager of the Advance Pitstop outlet in Dundrum, Co. Dublin, who provided tyres for analysis as part of this campaign said: “I regularly see tyres like this on vehicles coming in to our depot and in many cases the owner is totally oblivious either to the condition of the tyres or to the potential impact they could have on the safety of their family who may even be in the vehicle with them in the depot. “It really brings home to me how important it is that drivers take responsibility for checking their tyres on a regular basis. Indeed, as some of our photos of the bad tyres show, some of the problems were on the ‘inside’ rim of a wheel, so not immediately visible on a casual inspection. The truth is that a tyre can only be fully examined by gaining access to the full wheel through use of a ramp or by hoisting the vehicle. Any reputable tyre dealer will provide a free tyre check to motorists and we would certainly encourage drivers to avail of this so as to have a trained tyre fitter check out your tyres on a regular basis”. Under the terms of the recently introduced tyre safety penalty point regime, if stopped by a Garda, the owners of any of these tyres would have been facing a fixed charge notice of €80 and up to four penalty points if the matter goes to court. The regulations came into force in April of this year and an analysis of the Garda figures on penalty points issued shows that the enforcement of these tyres safety regulations is getting off to a very slow start. Up until the end of August, so far just 308 people were issued with penalty points for a tyre-related infraction. This compares with some 82,783 notices issued for drivers who were caught holding a mobile phone - admittedly that is for the full eight months, whereas the tyre enforcement figures are only since May. Dennigan concluded: “Earlier this year, the Road Safety Authority highlighted that defective tyres were a factor in 71 road deaths during a five year period. 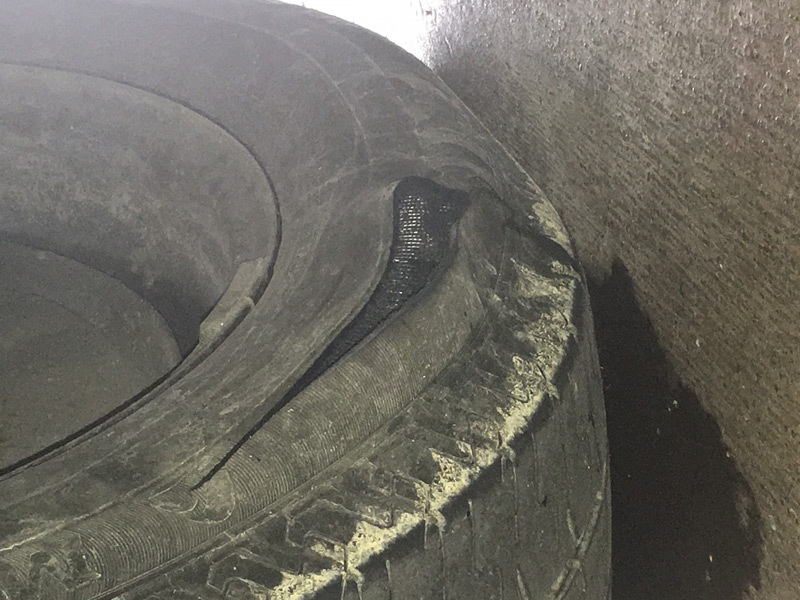 Going on the basis of our analysis of some of the ‘bad tyres’ that were replaced at depots across the country, drivers still are not getting that message and until enforcement of the new tyre regulations is significantly ramped up by the Gardai, tyres like the ones we have highlighted here will continue to be a serious problem”. Continental Tyres is advising motorists that, in order to stay the right side of the law, it is very easy to carry out a quick tyre check on their cars and that this should be done on a regular basis. However, as our survey of replaced tyres shows, it is also advisable that motorists bring their car for inspection by a trained tyre fitter at regular intervals. In addition to checking for cuts, bumps or uneven wear on a tyre, motorists can check the tread depth of their tyres very easily with the use of a one euro coin. The gold band on the front face of the coin (beside the large no. 1 and map of Europe) is 3mm wide so by inserting the coin into the centre grooves of the tyre, you will be able to see how much tread is left on your tyre. Safety organisations and most premium tyre manufacturers recommend that motorists should think of changing their tyres when the tread depth goes below 3mm as the tyre’s braking ability can be seriously compromised the closer it gets to the legal limit of 1.6mm.